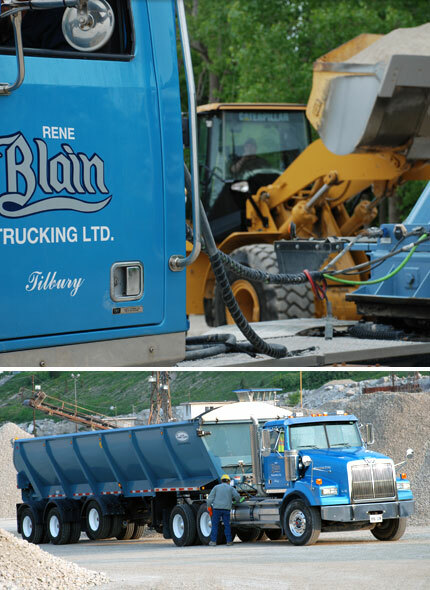 Here at Rene Blain Trucking LTD. we have been suppliers of construction materials including OPSS- A Gravel, B-Gravel, Sand, Stone, Dirt, Topsoil, Lime and other aggregate materials to multiple local municipalities, park departments, windmill developers, oilfield services, builders, landscapers, landscape suppliers, masonary suppliers, paving companies, nurseries, garden centers, private, contractors and homeowners since 1947. It has been wholly family owned through 3 generations of still active and experienced family members. Trucking isn't just a job, it's our life.